Ducks seem to be in the same category as squirrels on Anna Maria Island: they are not nearly as glamorous as some of the other fauna. They are common all around the United States. But sometimes, after one has marveled at ospreys, egrets or even roseate spoonbills (four of which I saw on the way to Publix market the other day), it’s kind of nice to run into just a plain old duck. Sadly, that’s exactly what some motorists have been doing in the vicinity of Holmes Beach City Hall, where a family of ducks is known to live. Last I heard, one duck had been hit by a car and killed. Another had just gone missing for awhile. Some people have suggested putting up “duck crossing” signs, and I think that’s a good idea. It’s always a pleasure to look out the window and notice a duck, or two, calmly paddling up or down the canal. One of my most interesting duck sightings was when I was the one who was paddling. While kayaking I passed one of the rare canal frontages that has mangroves instead of a sea wall. Looking under the mangroves, I noticed a small gully. Suddenly, two duck waddled across the gully. 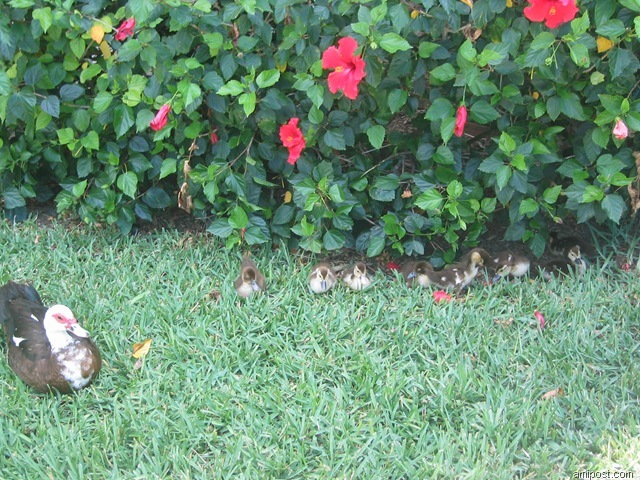 I wondered if this were a nesting site for them. It certainly was well protected. It’s comforting to see a duck swim by, simply because they are so ordinary. Before we moved to Florida, I dreamed of living somewhere with a pond and ducks. Little did I know how much more I would have out my door, but I still appreciate the ducks. 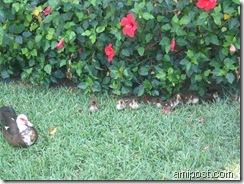 This entry was posted in Wildlife and tagged bird watching, ducklings, ducks, suncoast wildlife, Wildlife Inc on October 14, 2009 by Mike.